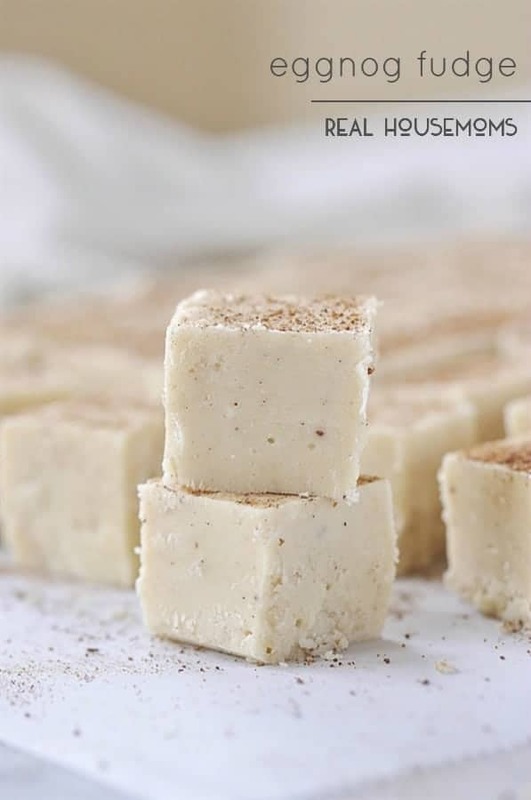 Eggnog is one of my favorite winter flavors and this EGGNOG FUDGE is everything I love in a holiday treat! Candy making is an important part of our family’s holiday traditions. Each year I host an Annual Cookie and Candy Making Day before Christmas. If you have never held a cookie making day before I’ve shared some tips and tricks with you on how to host a cookie baking day here. At our cookie making day we just don’t make cookies though. 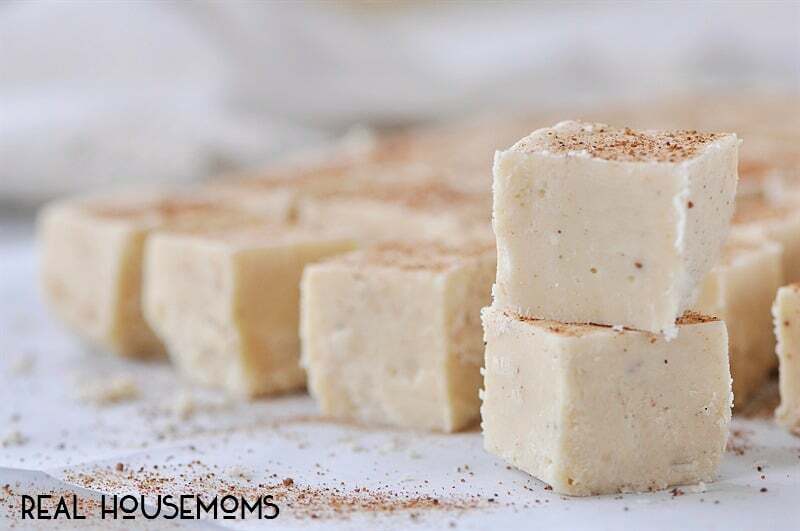 We make candy too and fudge is definitely at the top of the list. My mom is usually the fudge maker and she is famous for her Rocky Road Fudge. She has been making it for years. We have our traditional, must make candy recipes we do every year but I usually try and experiment with one new candy recipe each year. 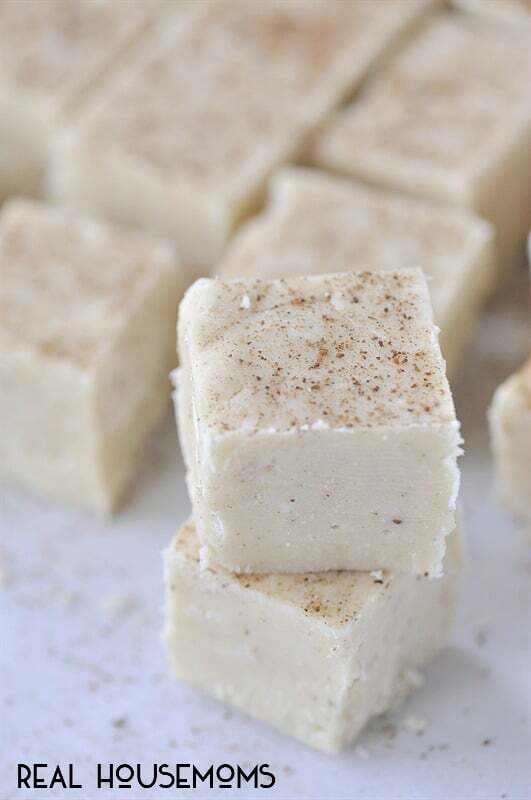 This year it is Eggnog Fudge. I love eggnog. The holidays don’t officially start for me until I’ve purchased my first carton of eggnog. I then hide it in the back of the refrigerator so I don’t have to share it with anyone! I did save a little of it though to make some fudge. 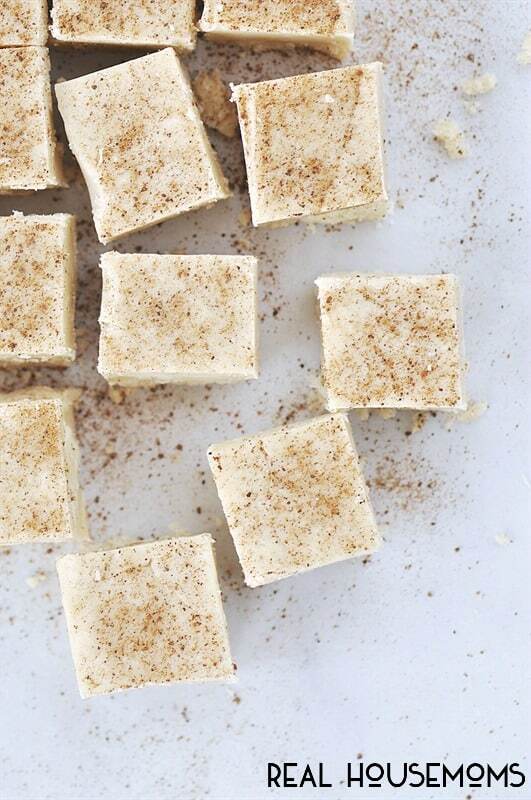 The nutmeg is what really gives the true eggnog flavor. There is nutmeg in the fudge and then a sprinkle on top too. For successful fudge making, you need two things, a candy thermometer and a good heavy pan. If your pan isn’t heavy enough your fudge will burn. Grease a 9 inch sqsuare pan. Combine the sugar, butter, eggnog and 1 tsp nutmeg in a heavy saucepan. Bring to a boil, stirring frequently. When it comes to a rollilng boil, add a candy thermometer to the side of the pan. Heat mixture to 235 degrees F. This will take about 10 minutes. If you don't have a candy thermometer you can test it by dropping a small amount of syrup into cold water. It should form a soft ball that flattens when removed from the water and placed on a hard surface. Remove pan from the heat, add white chocolate, marshmallow cream and vanilla. Stir until fluffy and it loses it's shine. Spoon into prepared pan, spread evenly.